Growing concerns over high-performance, self-regulation and memory development are boosting the demand for cognitive and brain fitness solutions around the world. Cognitive assessment and training is becoming a billion dollar business and thereby key market players are increasingly focusing on the development of advanced brain training apps and solutions to strengthen their market position. Moreover, rising need for the improvement of employees performance in organizations driven the cognitive assessment and training solutions for corporate environment. In 2015, as per Association for Talent Development, leading U.S. organizations spent over USD 170 billion on employee learning and development programs. Rising expenditure by companies for training and development of employees are accelerating the growth of cognitive assessment and training market. Furthermore, education sector and healthcare sector are vastly adopting the cognitive assessment and training solutions to meet the critical challenges while assessing the mental health of students or patients. Rising prevalence of cognitive impairments is leading to the huge adoption of cognitive assessment and training programs and solutions globally. Global cognitive assessment and training market valued USD 2.20 billion in 2016 and is projected to grow at a CAGR of 29.5% during the forecast period. 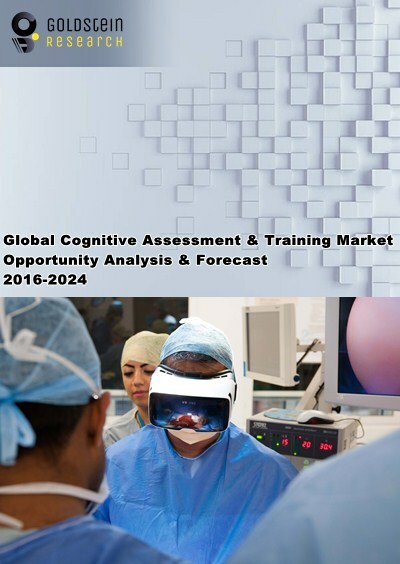 North America and Europe together held the largest market share of global cognitive assessment and training market, due to wide adoption of cognitive assessment and training in treatment for cognitive diseases. North America cognitive assessment and training market valued USD 0.8 billion in 2016 and is projected to reach USD 5.57 billion by 2024. Asia-Pacific region is expected to experience the robust CAGR during the forecast period, owing to the growing concerns about cognitive health and diseases in both education and healthcare sector. Factors such as rising brain fitness awareness and growing concerns over memory performance and skills enhancement are driving the growth of global cognitive assessment & training market. Increasing number ageing population leads to mounting prevalence of diseases such as Alzheimer’s are propelling the demand for solutions which can tackle the critical conditions. Healthcare industry players are continuously investing in cognitive assessments tools and solutions to improve the brain fitness of patients and thereby creating pool of opportunities for cognitive assessment & training business.